These chairs will add some down home comfort to your party. Pair them with a couch and a couple of tables and you have the most wonderful seating area for conversations, or just lounging. 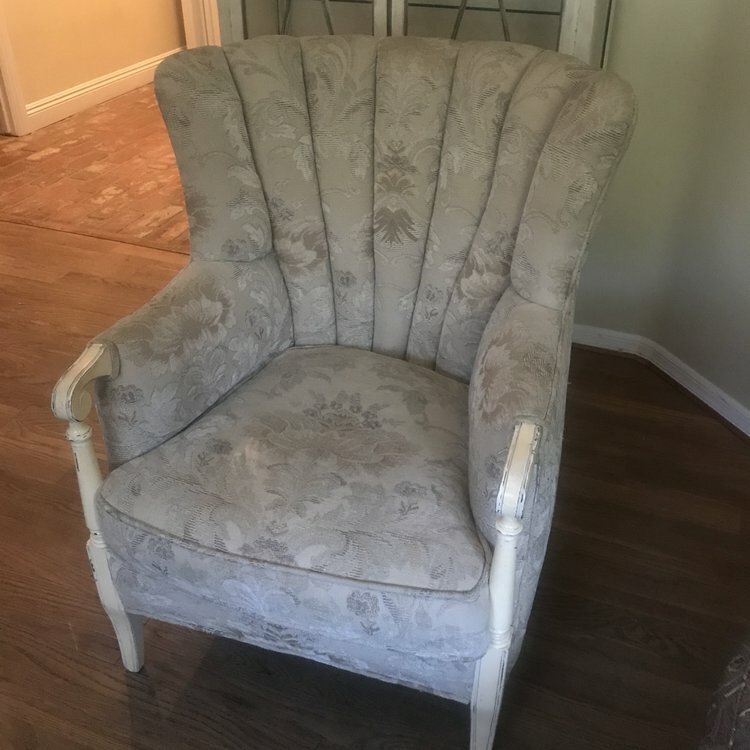 Cream, loose back, Bergere chair with floral carving in the wood. Matching fabric with Camila and Hannah. Seat 26"x24". 34" tall. Cream on cream floral print wingback chair with tufted back and wooden legs. Pairs with Pearl. 37" high x 29" wide x 21" deep. 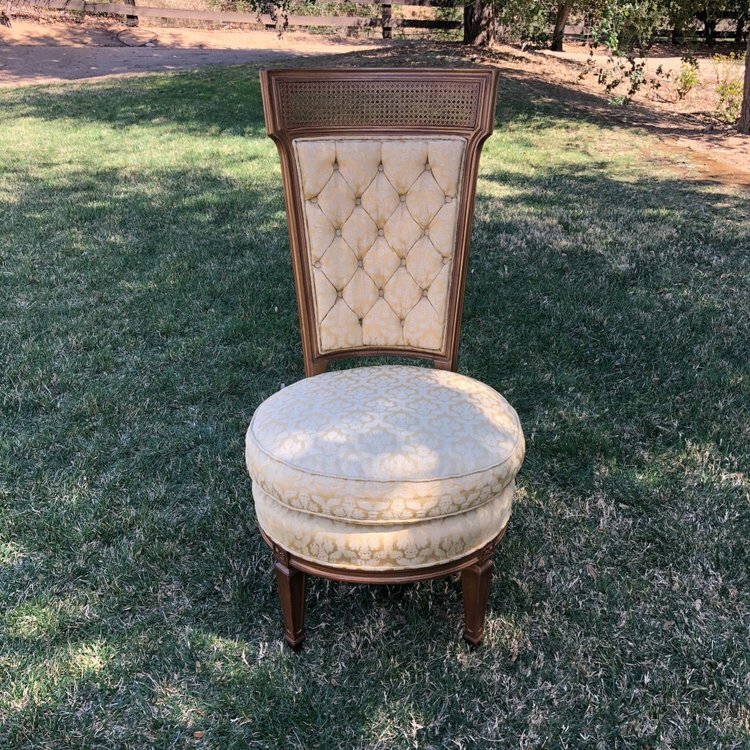 Cream damask chair with tufted back. Ornate wood carvings. Perfect for those beautiful bridal portraits. 44" tall x 28" wide. Seat 22" x 18"
Mid-century modern, gold patterned fabric, vanity chair. Tufted back. Seat height 17". Overall measurements 40" tall x 19" wide. Mid-Century rolled wing back chair with wooden accents. Beautiful magnolia patterned fabric with a green, brown, and ivory color scheme. Double piping. Photographs beautifully. 35.5" tall x 28" wide. Seat 26" x 19". Green and cream Mid-century modern laurel print with tapered legs. Loose back with T cushion seat. 31" tall x 37" wide. Pale mint velvet chairs with mahogany turned wooden legs. Curved arms with nail head trim. We have two. 27" wide x 18" deep x 35" high. Paisley Bergere with walnut wood floral trim. Solid back. Navy, burgundy, green, and beige. Seat 29" x 24". 37.5" tall. We have two of these. Powder blue and taupe Damask fabric chair with a dark walnut swirled leg. 37" high x 29" wide x 21" deep. Hot pink velvet embossed damask on a taupe cotton base fabric . French Provincial wooden legs. Tufted, unique shaped wingback chair from a true Mid-Century Modern era. This chair has a lot of sass. 40.5" tall x 32" wide. Seat 21" x 26". Orange velvet Bergere chair with wooden detail. 27.5" wide x 29" deep x 32" tall. 18" seat. Wine floral print Bergere chair with scalloped back. 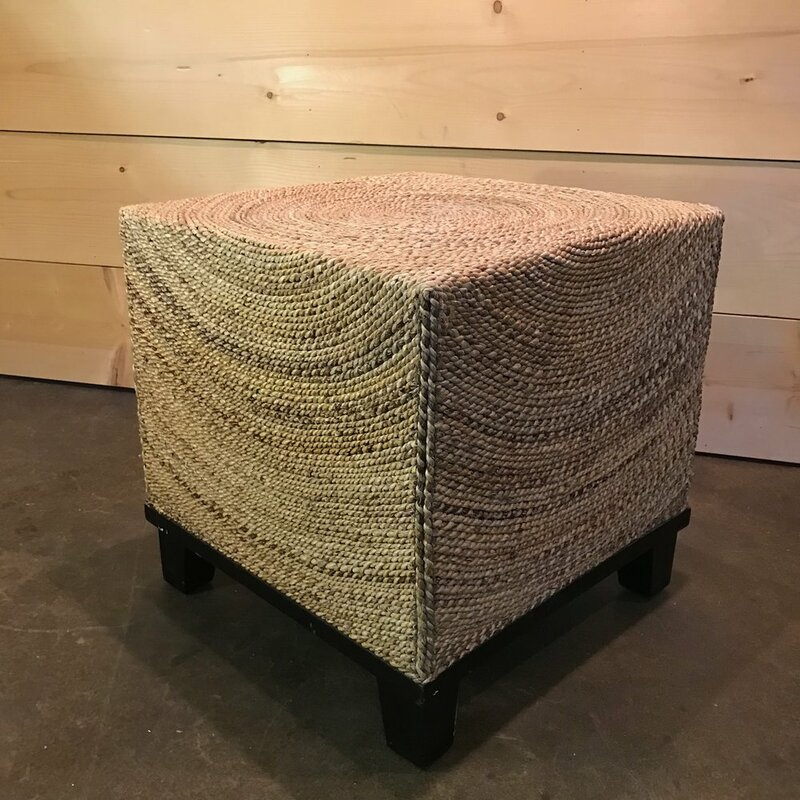 Loose pillows on woven wicker base. Matching ottoman. Carved floral wood trim. 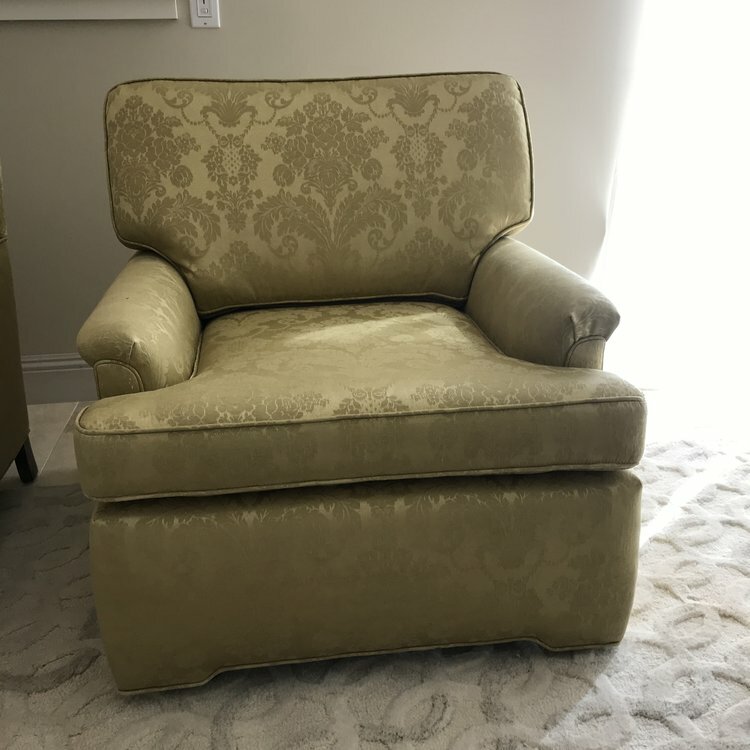 Chair 30" x 19" x 38.5" Ottoman 19" x 21"
Seagrass wingback chair. Cushion with multiple fabric options. Pair it with one of our great down pillows. Seat 23" x 21.5". Overall measurements 42" x 29". 40.5 tall. Petite Peacock Chair. Perfect for that BOHO bride. Measures 54” high x 37” wide. Seat is 18” round. Cream damask fabric, small ottoman. Pairs with Chloe. 32" x 24" rectangle. 13" tall. 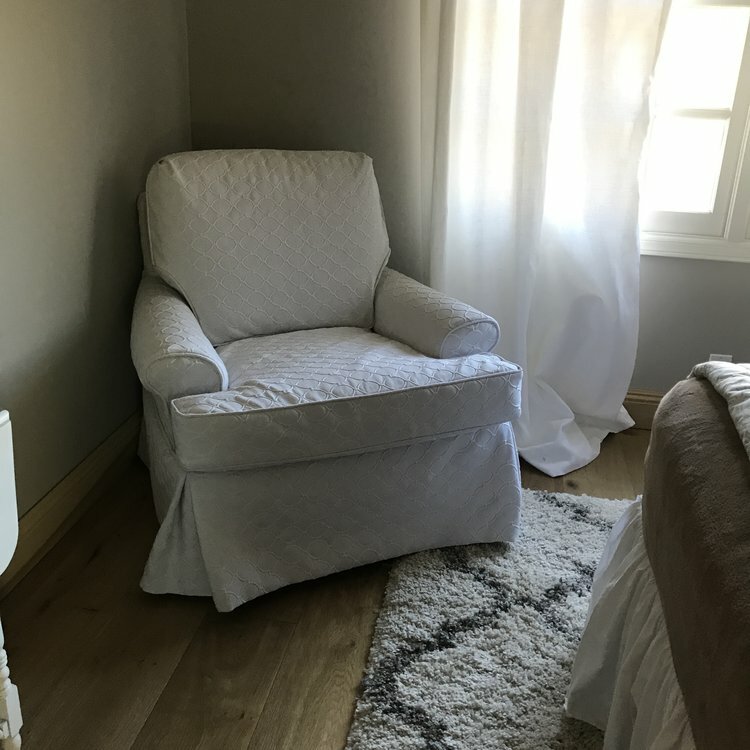 Cream, Bergere chair with padded detail on the arms. She's cute as a button. Matching fabric with Natalie and Camila. Seat 25"x19". 34"tall. Cream, Bergere chair with padded arm detail with flower carving in the wood. Matching fabric with Natalie and Hannah. Seat 27.5"x20". 37" tall. Tan textured damask with tuck and roll back chair. Mid-century modern. Cream wooden trim. 27" wide x 36" tall. Seat 22" x 23". Mid-century modern gold silk damask fabric. Four sleek tapered wooden legs. Pairs with Ginger of course! 30" high x 33" long x 30" wide. 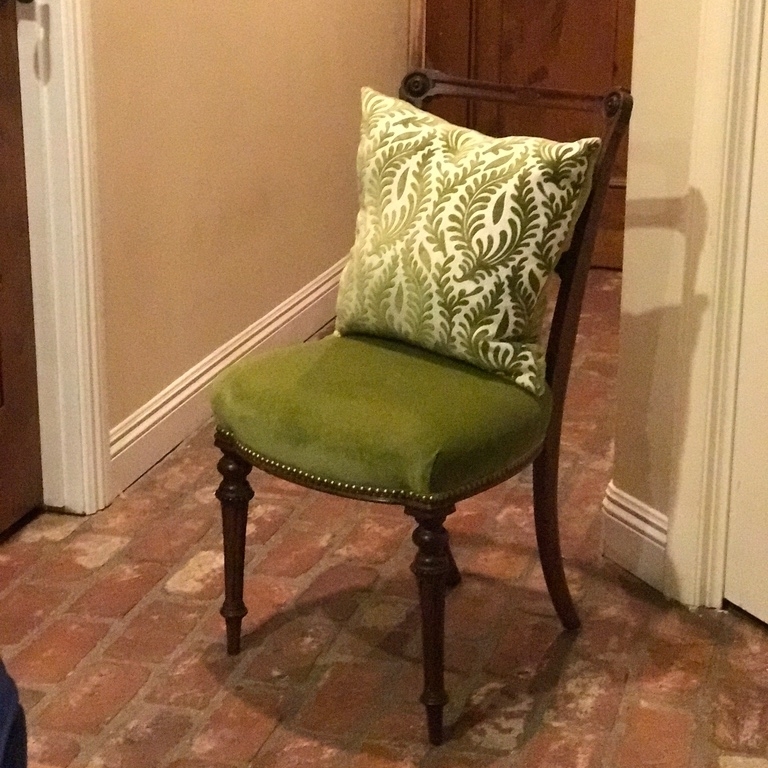 Green velvet Bergere chair with cane back and loose cushion. Add a pillow for a different look all together. Seat 23"x18". 30" tall. 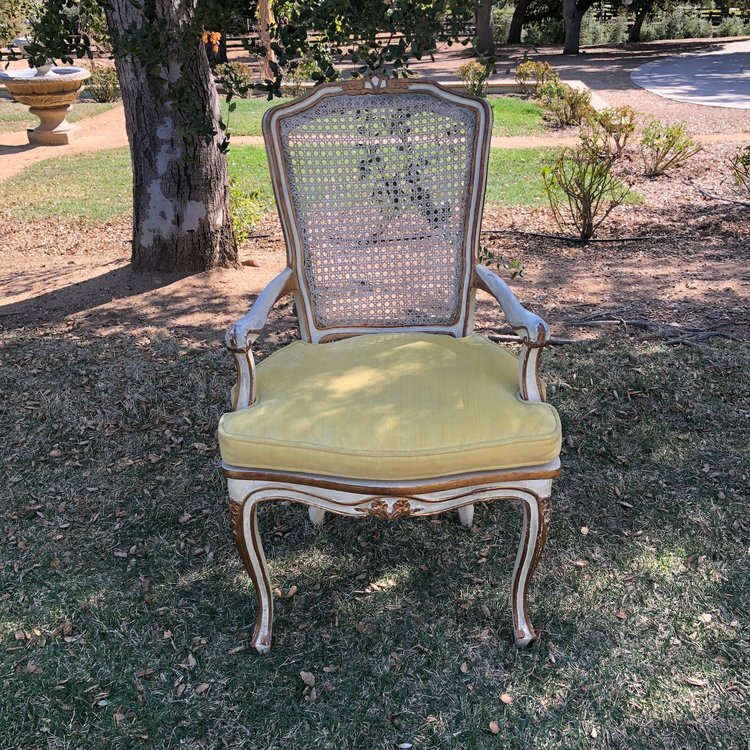 Beautiful French Provincial chair with caned back, gold leafing, and gold velvet seat. 40" tall x 24" wide x 18" deep Great choice for a sweetheart table. Navy blue velvet chairs, with wooden arms. Seat 24"x28" by 35" tall. Great pair for a sweetheart table. Hot pink velvet, heart shaped chair with a tufted back and a straight pleat bottom. This little cutie with steal the show. 33.5" tall x 21" round. She is only 12" off the ground. Looks perfect in a bridal boudoir shoot or with one of our petite dressing tables. Orange letter stuffed chair with rounded arms. 22” deep x 34” high x 35” wide. Burgundy, cream, and green plaid, country style chair and ottoman. Sculpted floral leaf detail in the wood. Chair 30" x 19" x 38.5" Ottoman 19" x 21" sculpted. Very large comfy indigo and cream patterned club chair with a wooden body. A perfect choice for a "man's chair". Overall height 37". Seat 32"x30". Brown wicker chairs, 36"wide x 37" high x 22" deep. Seat 16" high. We have two of these chairs. They are also matching with a couch. Two upholstered tapestry benches with a metal scrolled base. Very Boho. 40” wide x 18” deep x 22” high. Vintage gold velvet, split seat, intricately carved wood bench. 41" long x 16" wide. Overall height 22" with seat height at 15". Bone and taupe damask linen wing back chair with flared arms and curved wooden legs.. Very Bohemian pattern. 33" wide x 45" tall. Seat 19". True white, circular geometric, fabric chair. Loose back with T-cushion seat. box pleated corners. 31" tall x 37" wide. Seat 33"x40". Mid-century modern gold silk damask chair. Rolled Back with a piped box bottom finish. Paired with Fred of course! 33" tall x 38" long x 32" wide. Apple green paisley linen club chair with wooden legs with brass rollers. Rolled back. Seat 23". Overall 36" x 37"tall. Matching Ottoman with brass roller legs. 24" x 19" rectangle. 17" tall. 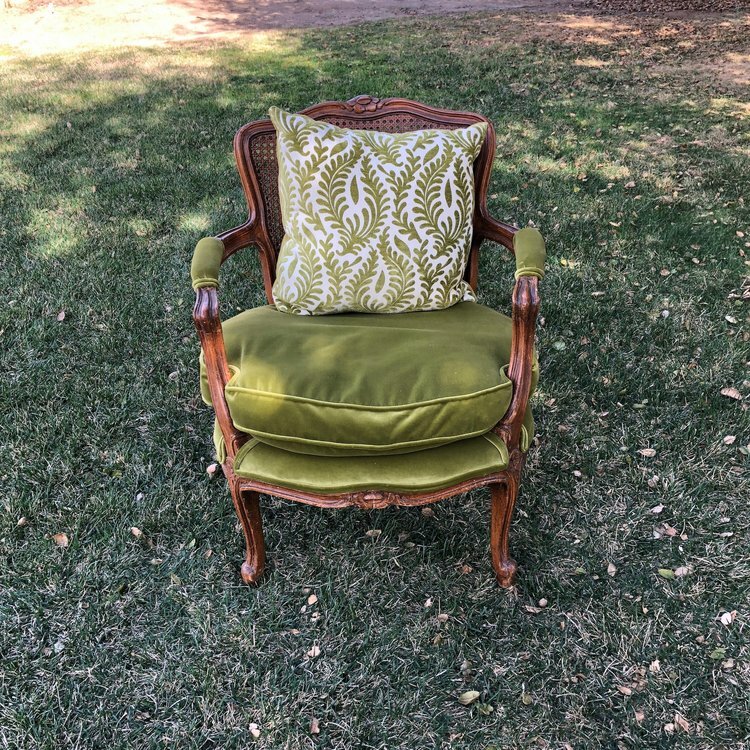 Petite green velvet chair complete with brass nailhead and vintage carvings. Throw a pillow on him and show him off. 33" tall x 18" wide. Seat 18" square. Gold velvet Bergere chair. Beautiful cream painted wood with gold leafing. Caned back with French Provincial legs. 32" tall x 25" wide. Seat 19" high. We have two. Vintage cream wooden chair with French flair leg. Blue velvet seat with double piping. Scroll floral embellishment. Seat 17" x 19". 33" tall. 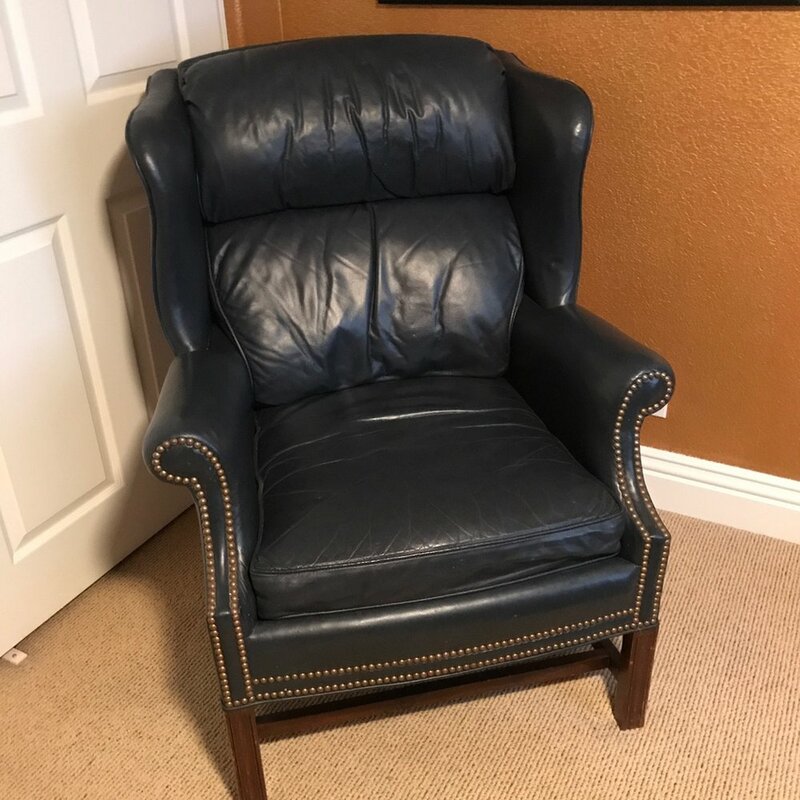 Navy blue leather wingback chair with brass studs. Perfect paired with Ralph. 40" tall x 32" wide x 33" deep. French wooded chair with a pink toile patterned seat. Add a pillow for a different look. Petite wingback chair with a round seat. Pleated ruffle around the bottom of the chair. Wine pattern printed cotton fabric. 34" tall x 32" wide. Round rattan chair with cushion. Ottoman included. Chair: 45" wide x 33" high. Ottoman: 18" wide x 14.5" high. Perfect for that Boho look. Cream textured linen ottoman. Great as a coffee table with or an extra seat in a lounge area. 42" x 25" rectangle. 18" tall. 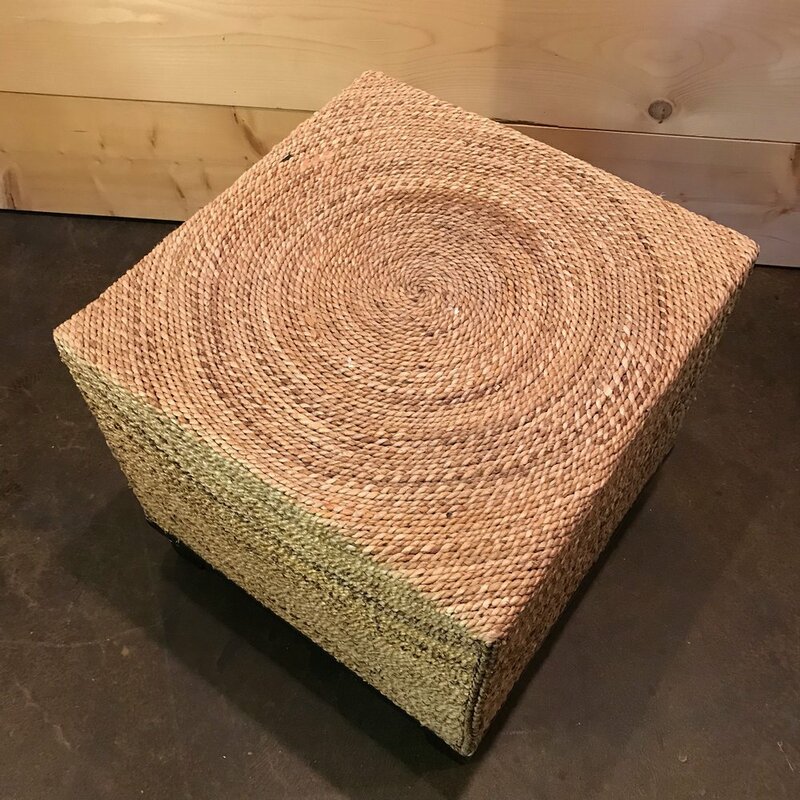 Rattan stool 22” square x 22” tall.